I took this picture last Saturday, after the National Stuttering Association's Youth Day. 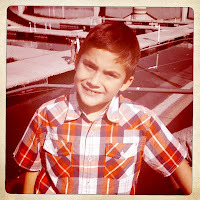 Bo, Nate and I walked down to Tempe Town Lake and enjoyed the beautiful day and the water after an informative morning. Nate loves the outdoors, and can sit quietly taking it all in for quite a while. It's rare that he gets the chance, because his brother and sister are more the type to say "Yep. Saw this. What's next??" without any contemplation time at all. Lydia may change as she grows, but Colin is always on to the next thing. I was glad he had the chance to sit and watch the water for a while on Saturday. The Youth Day event was wonderful. Nate said that the best part for him was hearing other people stutter. I had never thought about that before, but he probably has never heard anyone who stutters speak before. For him, listening to the panel of adults speak (and stutter) seemed to relax him. For me, listening to the adult panel made me realize that we haven't done anything wrong. 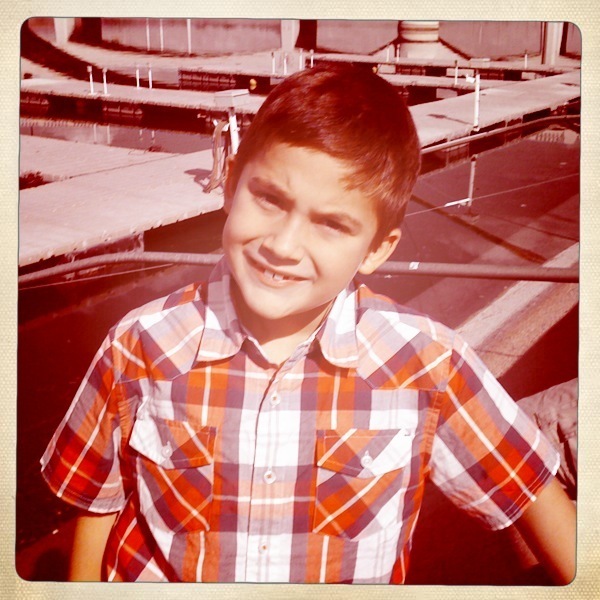 I had some guilt last year for not starting him in speech therapy sooner, and for homeschooling. As I listened to these adults, almost all of whom have stuttered for as long as they can remember, I realized that giving him that early foundation of unconditional love and support was the best I could have done. He's being teased now, but for the last 8 years he hasn't been teased regularly. (And we're addressing the teasing. Please don't email me and insist I must do something about it. Believe me, we're addressing the teasing!) But, in the years we homeschooled, he grew up with a familiar group of kids who knew him as Nate, and knew that he needed extra time sometimes to get all his words out. Part of the acceptance was because homeschooled groups of children tend to be smaller than school-groups and also because there are many more adults close at hand to keep an eye and ear on what's going on and are able to step in and address anything that comes up. Nate is very self-confident, friendly and out-going. Until the last couple months, we have never seen him let his stutter hold him back from anything. I know that with the right guidance, these few months will just be a blip on his confidence levels. He is not a stutterer, he is a kid who stutters. Just as he is a kid who loves to draw, be outdoors, play video games and hug his mom. Stuttering doesn't define him, it's just a part of him. And, since Saturday? His fluency has been extremely good and he has gone long stretches without a stutter. One of the panelists said that he has some months where he has near-perfect fluency and other months where he struggles with disfluency almost every day. Nate will probably always have to work at his speech, but it will never hold him back. For some reason, I avoided fish tacos for years. They just didn't sound good to me. Then, a little over a year ago I tried one, and found that I liked them! I was even more surprised to find out that Colin likes them as well! Since Colin tends to be our pickiest eater, I was a little amazed to find that he likes them. I couldn't believe it took me so long to find out my entire family would be happy eating fish tacos. My fish taco recipe is pretty simple. I cook up some frozen fish fillets, mix up coleslaw mix with a bit of tartar sauce, and wrap it up in a soft tortilla. Gorton's recently sent me coupons so I could try their fish in my yummy fish tacos. I recently made them with the beer battered fish fillets and they were gobbled up. I was surprised to learn that Gorton's has been in business since 1849 in Gloucester, MA. They are committed to green practices and also seafood sustainability. They also sell a wide variety of seafood products. I knew about the battered fish, including tilapia, but they also offer grilled seafood, including shrimp. Until November 30, you can visit their subsite -- We Love Fish Tacos -- and upload a picture of your fish taco for the chance to win a trip to Mexico. Visit their main site, www.gortons.com to find recipes and coupons. They provided me with 2 coupons to give away to my readers! Each coupon is good for any Gorton's Frozen Seafood Item and expires on 12/31/11. Mandatory Question: Have you ever had a fish taco? Giveaway ends November 2, 2010. Entries must be completed on the giveaway form. Link to all giveaway rules can be found in the right column. For a change of pace, Bo is traveling this week for work. While we miss the extra adult, we're actually just fine, but the title of this post made me giggle a bit. I will enjoy a drink tonight after we're done with music lessons and spelling practice and the munchkins are settled into bed! About a month ago, I received samples of Alizé Gold Passion and Alizé Red Passion. I never knew France distilled vodka, but I am glad that I know it now! These vodkas have a very smooth and lightly fruity taste. One of my easy, favorite ways to enjoy it is to pour a shot into diet Sierra Mist Cranberry soda. 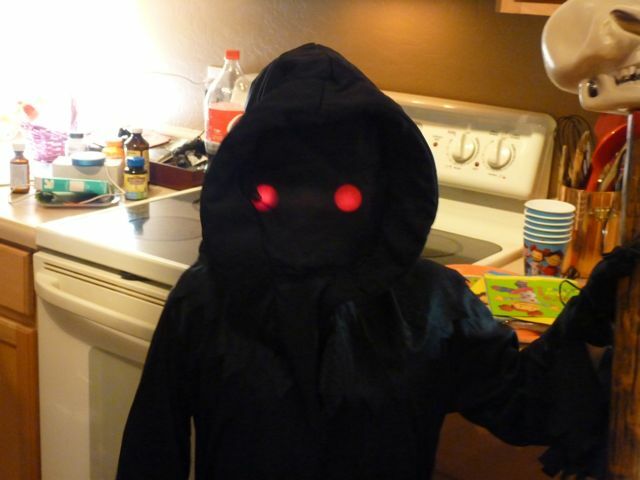 We were hoping to throw an adult Halloween party this year (anybody reading remember our first Halloween party together? Bo dressed up as a prince -- tights and all!! gosh, I wish I could find those pictures.) but the stars didn't align for us with major job changes, travel and more. We're already planning for next year, and I think it will be fun to have these drinks for our guests. Alize shared some fun Halloween cocktail recipes with me, so if you are throwing your own Halloween party this year, I would definitely pick up a bottle or two of Alizé Gold or Red Passion premium vodka! They have 2 other flavors you might want to try as well -- Bleu and Rosé. Serve chilled in a champagne glass. Chill Alizé Red Passion and red wine. Just before serving add 1 ounce ginger ale. Serve in a wine glass and garnish with a slice of apple or orange. Top with lemonade and serve in a martini glass. 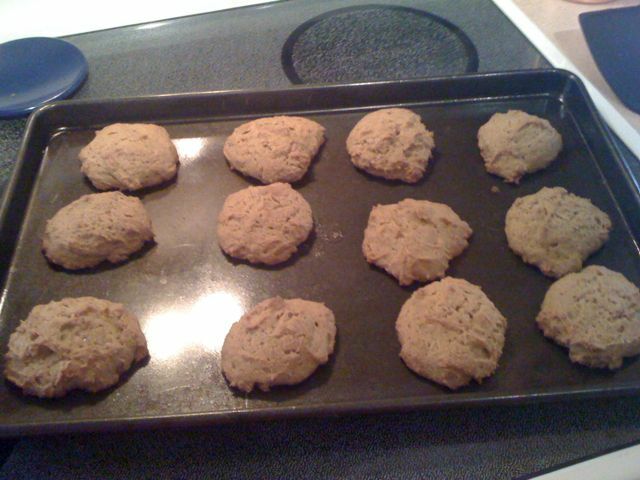 I recently made these soft pumpkin cookies from the Very Best Baking site. I first saw the link on Facebook, then a couple of my friends on FB made them and raved about them, so I had to try them! They were delicious!! Instead of butter, I used Earth's Best Vegan Buttery Sticks so my sister could eat them, and skipped the glaze (not really necessary and I didn't have any milk substitute in the house). I also used 2t of Penzey's pumpkin pie spice instead of the cinnamon & nutmeg the recipe called for. And, as long as I'm making all these disclosures, I apparently also made them larger than suggested since I ended up with 30 cookies instead of 36. Ever since my sister found out about her dairy allergy, I've said we'd experiment with cooking (especially baked goods) so she could still enjoy sweets. This was my first try with a dairy-free baked good and I'm happy with the result. The vegan sticks did not cream as nicely as butter, but the flavor is very good and you wouldn't know they were dairy-free. Now that the weather is cooling off, I am going to make more dairy-free treats! Lydia helped make them, and the boys came home from school to find freshly baked cookies! They're no substitute for chocolate chip cookies (but, oooo, maybe next time I'll add chocolate chips to these! ), but were a delicious snack! These converters help save water by getting rid of the flapper (main source of leaks) and also giving users the choice of two flushes. The box claimed that it could be installed in 10 minutes -- and they were right! Bo was joking around a bit and sent Nate into the bathroom with the instructions and told him to go ahead and replace it. Nate did a great job starting the project, but did need a little help to finish it up. So, I can also say that it's so simple a bright 8yo can do it! I'll be interested to see if we will notice the difference in our water bill next month, but we could see the difference in how much water each flush uses just by watching the tank. With a house of 5, we flush the toilet quite a bit! 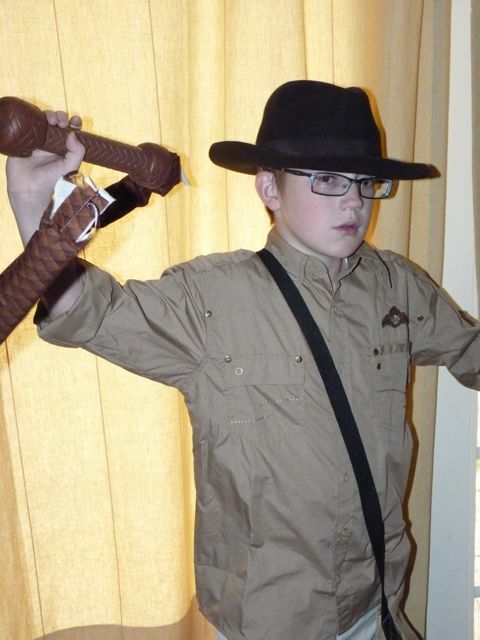 Nate gave this presentation last spring to friends, family and his enrichment class. He did a wonderful job, and shares some great information! Since today is International Stuttering Awareness Day, I thought it was worth re-posting. Nate wanted to give this presentation to his class in video format. The school blocks YouTube, and I didn't have a PC-friendly copy to share with his teacher so he decided to have me record him again. (After we did this video, I figured out how to make it PC-friendly and was able to send last year's video to his class.) You can see the extreme difference between last May and now. He is embarrassed by this video and has agreed to let me post it only for a brief time. I wanted to post it to show that he HAS regressed and I'm not being unrealistic in my expectations. I also wanted to post it to give hope to others who are struggling with stuttering. We know that he will improve again, and learn the tools to help him kick stuttering. This version of the presentation breaks my heart. His stuttering is the worst it has ever been and I don't have an explanation why. It may be the stress of outside-schooling, or a developmental stage, or something else. His speech has gotten progressively worse since the start of the school year. The 2nd video has been pulled in respect of Nate's wishes. I'm happy to report that his speech has taken a turn again and he is more fluent than he has been the last couple months. We know that it will be an up and down experience, but he will continue to use his tools in an attempt to have more fluent days vs. disfluent ones. I also want to thank those of you who left extremely kind comments, and sent wonderful emails. They brightened Nate's day, as well as mine and Bo's. Thank you!! 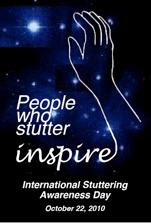 Tomorrow is International Stuttering Awareness Day! My 8yo, Nate, has a severe stutter. 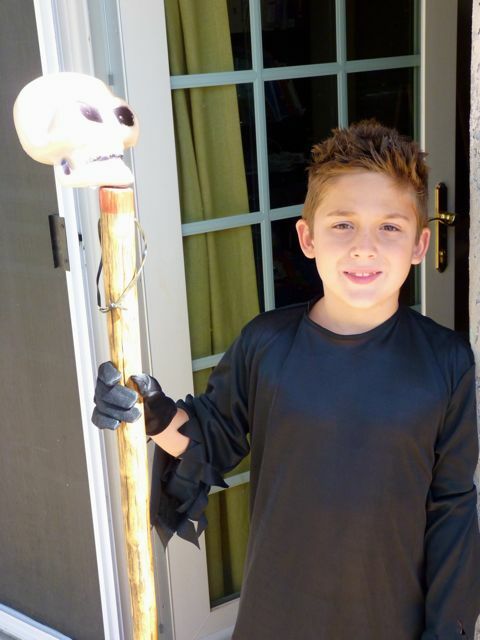 He began speech therapy last year, and made significant progress. I've shared parts of his story over the last year, and I want to share another part today. He has stuttered since he was about 3, but we were encouraged by different pediatricians that he would outgrow it. 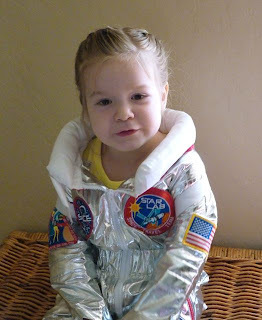 The stuttering seemed to come and go, and since we homeschooled it wasn't much of an issue in school. He's friendly, and even though he stuttered he still talked to strangers and shared his thoughts with others. The stutter never seemed to hold him back. We noticed it getting worse when he was 7, so we approached our local school and had him evaluated. He qualified for speech services, and received one-on-one therapy from the school's speech pathologist twice a week during the last school year. This year, we made the decision to enroll both boys in the local public school. One of the biggest surprises I had was to find out that he no longer had one-on-one speech therapy. He was grouped with 3 other boys, and he told me that none of them stuttered. As the year has progressed (they just finished first quarter), I noticed that his speech has gotten worse not better. At the end of the last school year, he could speak 2 or 3 sentences before stuttering. Right now, he can rarely speak 1 sentence without stuttering. His stuttering is becoming more pronounced, and secondary behaviors are increasing. I had the opportunity to sit in on one of his speech therapy sessions, and found that he received about 5 minutes of practice during the 20 minute session. The other children in his group have completely different problems with their speech, and while I understand their goals may be similar (fluent speech), they can't possibly learn anything from each other. I also understand that budget concerns and great need stretch the speech pathologist's time. I have the highest respect for her, yet at the same time feel that I must advocate for my son. I sat in his session the week before Fall Break, and my husband and I had many conversations about what to do and what our next steps should be. On Thursday of that week, Nate came home with a huge bump on his head. After many false starts and stutters, he was able to tell me that he was walking and talking with his head turned. He slammed into a metal pole pretty forcefully with his head because he wasn't looking where he was going. I asked, "Did you go to the nurse?" as I got an ice pack out of the freezer. (It was a very large lump!) He told me "No". I asked, "Did you tell Mrs. 3rd grade teacher?" He replied that he tried to, but she pretty much ignored him. After a few phone calls (and voicemails) I was able to speak directly to his teacher. She had no recollection of the conversation at all and felt terrible that he was hurt and didn't receive help. She asked him if he struggled telling her, and he told her that he was able to get it all out. She then asked if it looked like she was paying attention and he told her "No". She & I both told him that he MUST push for help when he needs it! He has to make sure that he has someone's attention, maybe start the conversation with "This is important! ", or even write a note if he is having a hard time talking. This was the first time that I ever realized that stuttering could be a safety issue. Nate is a sweet, kind and sometimes shy child. He sat the rest of the day with a big lump on his head, and never said another word about it. The lump is still noticeable (much smaller, though!) 2 weeks later. I worried about what would have happened if it was something more serious? I am sure that he did manage to say all that he needed to, but didn't feel up to trying to repeat himself a second time, so decided to let it go. I hope that we have impressed upon him the importance of speaking over and over again if necessary, but I am also even more pushed to find additional help for his speech. Tomorrow Bo, Nate & I are attending a National Stuttering Association conference. I am eager to connect with parents and professionals, while Nate has the chance to connect with kids who also stutter. 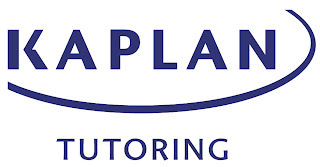 I want advice and help on how to handle the oral fluency reading tests he has to take regularly in the classroom. I want to find out what other resources are in our area. I want Nate to know that he is not alone in his stutter! I know this is long, but I'm going to close with some pointers when you encounter someone who stutters. Pause and let them finish. Even if it looks like they're staring away, they may have a silent block and they're still trying to get the words out. Even if it means that you'll have to keep silent for 30 - 45 seconds, you're doing them a favor by letting them complete their thought. Never, never, never mimic their speech. As difficult as it may be to believe, we've had adults as well as children mimic Nate's speech. It is not funny, and it does not help. The first quarter is in the books, as they say, and I had my first experience with parent/teacher conferences this afternoon. Colin made honor roll, and Nate would have as well if only they had honor roll for 3rd graders. Both boys are doing extremely well academically and are fitting in with their classmates just fine. We had no behavioral problems to discuss, and while both boys do have weaknesses, they are nothing that can't be worked on and overcome with a bit more effort. (And, really, how much of a weakness can it be if both boys exceeded expectations and earned mostly A's with only a smatter of B's?) Colin is still a bit of a class clown. Nate is quiet and studious, but kind and helpful as well. 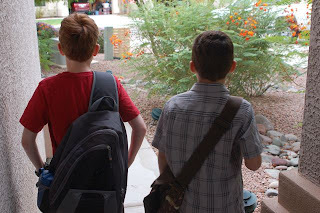 For this former homeschool mom, who worried about this school year, I am especially proud of my boys. They have made the effort and have adjusted wonderfully. They went into the year with a solid grounding, but of course we wouldn't be sure of that until the grades were in. I did just fine as their teacher, and they are exceptional students. I miss spending my days with them, though! At first, I thought it was funny that Hershey's has a "Center for Health & Nutrition" but after thinking about, I realize that it is true that everything is okay when done in moderation -- including food! Why not enjoy chocolate in moderation, along with a healthy diet and normal portions? I love chocolate and will admit to eating it weekly. Maybe more than weekly. I will also admit that I need to work harder on the moderation thing. I know intellectually that moderation is best, but it isn't always easy to put that into practice. I'm trying harder these days, though, and I'm hoping that I find some success. My BlogSpark and Hershey's sent me a bag of chocolate, along with a journal to keep track of my meal choices and exercise. I have read all the studies that show that those who keep a food journal lose more weight than those who don't and I know it's true for me as well. When I carefully record what I eat, I lose weight faster. Now, if only I can figure out a way to keep recording and not get totally bored with the idea of writing down what I put in my mouth and instead just eat! There are tips, ideas and recipes at a website that Hershey's has created -- The Moderation Nation. The website hopes to motivate readers and help them meet their goals in a healthy, sane way. They also have an iPhone app to help you while you're on the go. For one of my readers, I have a prize pack to give away that includes a bag of chocolate, a journal and a Moderation Nation t-shirt. Please click HERE for the Giveaway Form to fill out your information. Please do NOT leave a comment below -- all entries should be entered on the Giveaway Form. Good Luck! Giveaway will close on Friday, October 22, 2010. All giveaway rules can be found by clicking the link to the right! 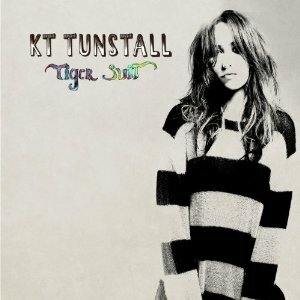 One of Nate's favorite songs is KT Tunstall's Black Horse and The Cherry Tree , so I was happy when offered the chance to review her latest release -- Tiger Suit . I like her voice, and I think she is very creative musically, as well as original. I'm not a musician, so for me, it often comes down to "Do I like this music?" because I'm not knowledgeable enough to pull apart the chords and instruments and all the rest. I can say that I do like this music and have enjoyed listening to this CD on my commute for the last couple weeks. Sometimes I can't wait to drop a CD into iTunes so I can remove the songs that I don't like, but I'm still listening to the CD and haven't wanted to remove any songs from the album. Two of my favorite songs are "Push That Knot Away " and "Fade Like a Shadow ". They both have catchy refrains and interesting music that have me playing them on repeat a few times before moving on. I haven't taken it out of the CD player yet, so I'll be listening to this one for a while! I like Wendy's. Years ago they had the best fries -- remember when they had thick steak fries? Their fries are typical of all the fast food places now, but they still have original items. Things like the baked potato, chili and Frosty still top my list of favorite fast food items. They have a new sweepstakes running right now which includes 4 questions to help you design your favorite "Pick 2" meal. The funny thing is that when I just ran through it, it gave me the exact meal I enjoyed just a few days ago! Apple Pecan salad with a side of chili! We had a magical afternoon, thanks to Feld Entertainment! I was given tickets to attend Disney Live! Mickey's Magic Show that is playing this weekend at the US Airways Center in Phoenix, AZ. It was a fantastic show and I feel so lucky that we were able to attend! There was a mix of Disney magic and traditional illusions by a couple great magicians. The boys were impressed by the feats of magic by the 2 magicians -- from escaping a locked box to switching places with Donald Duck in a locked cage. I am impressed by the level of professionalism and artistry that we always enjoy during these shows. It truly was a magical experience and one that I highly recommend. 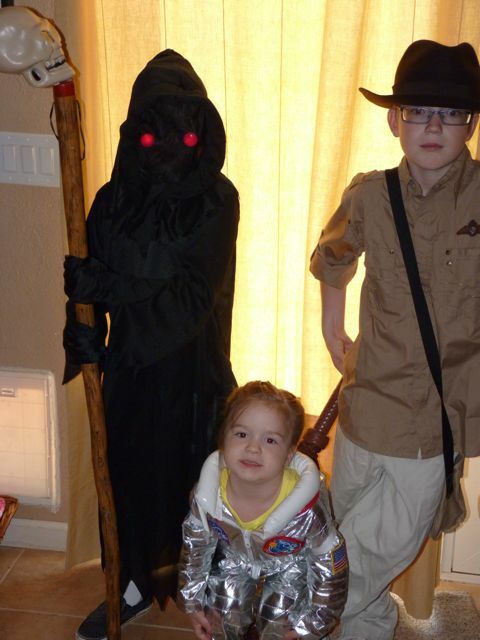 I heard from my giveaway winner, and she and her 3 sons had a great time as well! My only complaint was the number of camera flashes going off throughout the entire show. An announcement was made at the beginning asking people not to take flash photography, but there were some times during the show that the entire audience was lit up because of the number of camera flashes. The theater was nicely darkened for the show, and camera flashes were a definite distraction. I would fully support ushers asking people to stop taking pictures during the show -- and even taking cameras away until after the show if they wouldn't stop. We still had a great time, though, and I loved the show. The kids don't know it yet, but we have a trip to Disney planned before the end of the year. 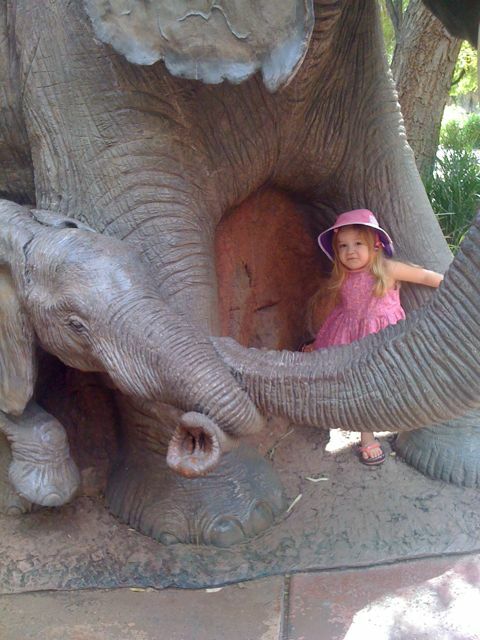 After watching Lydia's delight with the princesses on stage, I can't wait until she meets some up close! Whoops! I almost forgot to post my Tell Me Thursday post! As a dear friend on Facebook noted, this tree was NOT found in Arizona. When I went to Cedar Rapids last month, the hotel where I stayed was across the street from the river. The river's bank was lined with these trees and I enjoyed spending an hour or so walking through them and sitting under them. There's a certain amount of peace and comfort that I find among large trees. I love Arizona's landscape, but I never see trees like this anymore. There isn't enough water in our area for trunks to grow thick and branches to grow tall. I love trees and I think that if I had to name one thing that I miss from living in the Northeast and the Midwest it would be the trees. I really enjoyed the evening among the trees on my recent trip, and was feeling grateful for the opportunity. Last night, I said that we'd have a laid-back Saturday without any expectations, since the boys' cartooning class canceled. While my intention was to spend the day at home, that's not quite what happened. My beloved iPhone was having difficulty charging, and I was afraid that I would have to purchase a new phone. Bo encouraged me to make an appointment at the Apple store to find out if they could help me. I made an appointment for mid-morning and we all headed out. I was very pleasantly surprised that after the problem could not be replicated they offered to exchange my phone. I walked out with a new (refurbished, I'm sure since I have an older iPhone, but this one will charge!) phone and it didn't cost me a thing! I received an email earlier in the week that the Hallmark Christmas ornaments were coming out this weekend. I saw a Hallmark store and stopped in -- just to look. A half hour later I walked out with a tub of Halloween Silly Bandz to give out on Halloween, 3 packs of Silly Bandz for the kids, 2 photo ornaments and 2 keepsake ornaments for the boys. We purchase a special ornament each year for the kids, and the ones we found for Colin & Nate this year are perfect. Next, we stopped in Lane Bryant where I picked up a couple shirts that were on clearance. I probably would have picked up more but the boys were very antsy by this time and not interested in shopping anymore. Obviously, it was time for lunch, so we enjoyed some New York style pizza at a pizza joint that used wood-burning ovens (Bo's favorite kind of pizza!) The pizza was okay -- we probably shouldn't have ordered pepperoni as it was ridiculously greasy. Finally, we headed home where I began restoring my phone and headed over to the library so the boys could get some new books to read during school break. Home again, I called my sister and we headed out with Lydia to Cost Plus World Market so she could buy a single bottle of beer to make beer bread (no yeast! yea!) and then we had dinner at a Hawaiin BBQ place. Finally, we stopped at Fry's Grocery store to do some grocery shopping and home again where I am about to finally watch the final episode of Master Chef. So much for a quiet Saturday at home lazing around! I'd say we could do that tomorrow, but we have a symphony concert to attend after Mass! A very sweet friend (Hi, Wendy!!) 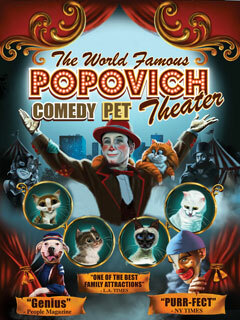 gave us tickets to enjoy "The World Famous Popovich Comedy Pet Theater" last night at the Orpheum in Phoenix. I admit -- we weren't sure what to expect. All I knew that it was a pet circus made up of cats and dogs that were rescued from animal shelters around the country. The show was great. I haven't heard Colin laugh out loud, with absolute delight, in much too long. He thoroughly enjoyed the antics of the clowns and the animals on the stage. We all had fun, but I think Colin laughed the hardest. The Orpheum is a beautiful theater that was originally built in 1929 and has been lovingly restored. It was the perfect venue for this vaudevillian show that seemed a throwback to entertainment from many years ago. The animals were amazingly trained, although they didn't always perform on cue! It was still delightful, and Gregory Popovich is a top-notch performer as well as an animal trainer. The supporting cast did a great job as well, and we laughed the evening away! The show is popular in Las Vegas, and they also travel the world (I can't imagine traveling with all those animals!) If you have the chance to catch a show, I know you'll be entertained. We had the chance to check out Punflay's ABC Numbers app for the iPad. They included the alphabet as well as the numbers, and Lydia has had a blast playing with the letters and pretending to trace the letters on the screen. Here she is! 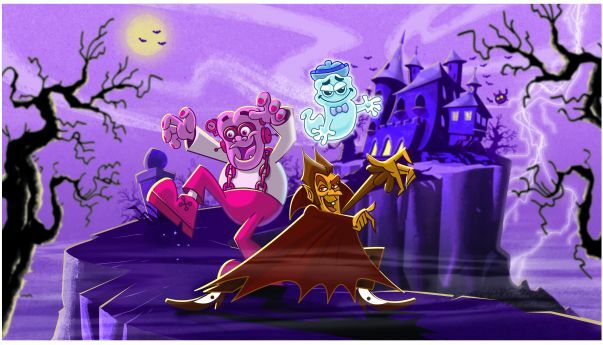 General Mills has produced these 3 favorites with a new look -- just in time for Halloween. Look for them at your local Target from now until Halloween. One of my lucky readers, though, can win a box of each of the cereals, a neat tote with a fun picture of the three "monsters" and a $10 Target gift card! 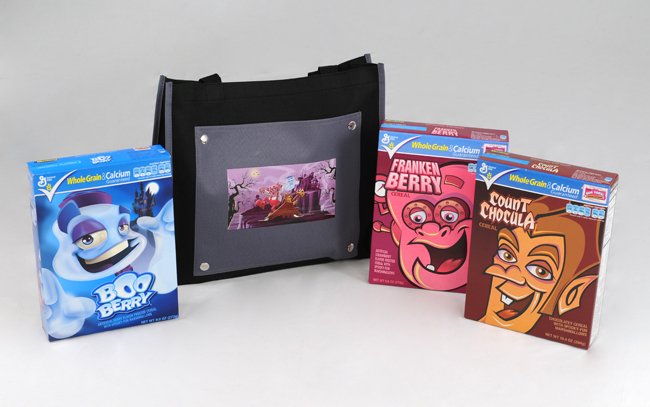 So you can get the cereal and bag before Halloween, I'll choose a winner on Monday, October 11, 2010. Mandatory Question: Which cereal was YOUR favorite as a kid? You will need the above information to fill out the official giveaway form. Entries left in the comments will not be counted when I enter the numbers into random.org to choose a winner. Good Luck!! If you really love these monsters, head over to www.grocerysavvy.com where you can check out a funny disco video starring our favorite cereal monsters! Last week, I posted about the Disney Live show in Phoenix on October 16 & 17. It's going to be a fantastically fun show all about magic!! I just found out that I have the opportunity to give away FOUR TICKETS to the 3:30 show on Saturday, October 16, 2010 at the US Airways Center. Mandatory Question: What's your favorite Disney magic trick? This shot was taken Tuesday afternoon during a very unusual, very heavy, Arizona rainstorm. 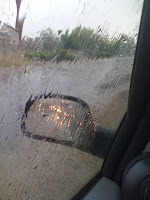 You can see the boys' school bus in my rear view mirror. I was home in time to pick them up at the bus stop, which they appreciated very much! This made my heart melt a bit. 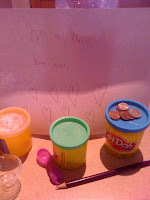 Lydia had taken a piece of play-doh and a dime with her in the car and to a restaurant. It was left on the table, and she was very upset in the car when she realized what happened. While she took a bath when we got home, Nate put together this tableau for her. (If you can't read the sign, it says "For You Lydia, Love Nate") He's an awesome big brother! The new season for Sid The Science Kid starts next week. This is a newer show, so my boys didn't watch it. Well, they didn't watch it when they were preschoolers! They watch it now along with their sister and enjoy the science lessons that each show shares. We recently had the opportunity to invite a few preschoolers over and watch some of the brand-new episodes from the new season. The kids had fun watching Sid & his friends and especially loved the dance scene in the episode about friction. They enjoyed copying the kids on the show, and had tons of laughs while doing so. Lydia received a Sid the Science Kid microphone and has been having a great time asking questions of anyone who comes in the door! She also received a science kit which her brothers actually enjoyed putting together. 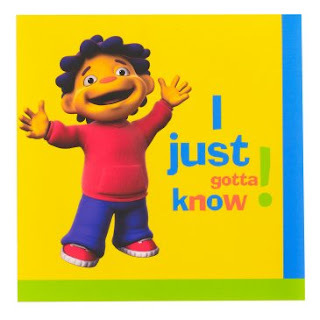 Sid the Science Kid airs at various times on PBS Kids. It is definitely a favorite show of Lydia's, and I've even grown used to the crazy hair colors. We had a few friends over recently to try out Nano Hex Bugs and a bunch of their accessories . These toys were a hit with ALL the kids -- from ages 2 to 9. In fact, I think the 3yo's had the most fun chasing the little bugs around! Nano Hex Bugs look like tiny, brightly-colored caterpillars and they skitter and buzz around on the floor. The movement isn't unlike real bugs, and the kids thought they were wonderful! A few did end up underneath furniture, but the kids were able to scoop them out pretty easily. The accessories include round battle areas , and straight-aways for the bugs to travel on. These items kept the bugs in an enclosed area, which meant they didn't end up under any furniture! The Nano Hex Bugs retail for between $7 - 8, while the sets vary between $9 and $50. I think these would make great stocking stuffers in a few months! They were definitely a hit at our house. This last video is a short one of the 3yo's playing with the tiny bugs.